The international community must be prepared to offer Cambodian Prime Minister Hun Sen guarantees for a “dignified exit”, the Southeast Asian country’s exiled former opposition leader told Euronews. Cambodians are due to head to the polls in July 2018 for a national election. “Nobody is eternal. He [Hun Sen] must realise that he has to prepare his retirement and I think we need to give him some guarantees,” Rainsy said. The call by Rainsy came just weeks after the European Union issued one of its strongest statements to date over the unfolding political crisis in Cambodia, warning that the deterioration of human rights there could affect aid and trade relations. Earlier this year, Rainsy officially resigned as president of the country’s main opposition party ahead of an amendment to the law barring convicted criminals from leading a political party. His replacement and party co-founder was arrested in September on charges of treason, which the government just weeks ago said it would also pursue against Rainsy in both Cambodian and French courts. More than half of the MPs from Rainsy’s Cambodia National Rescue Party (CNRP) have now fled the country ahead of its expected dissolution by the Supreme Court on Thursday. 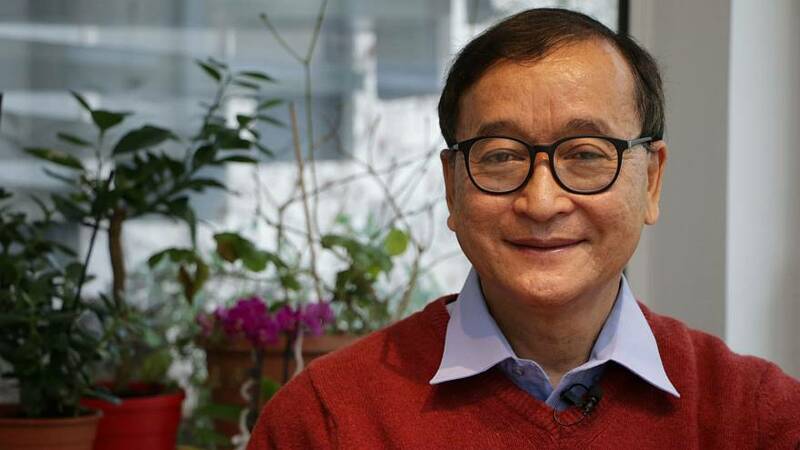 Speaking from his central Paris apartment days before the ruling, Rainsy said that if his party was dissolved, the opposition movement would adapt and take on a new form. “What is important is the will of the people. The people are not going to give up what they demand… This demand could take different forms, different shapes and different organisations but the battle will continue anyway,” he said. Rainsy cited declining support from the military in the run-up to the 2018 vote as a key reason for the prime minister being “more afraid than ever”. “Everybody knows that maybe from colonel up they could support Hun Sen, but from colonel down, the rank and file soldiers, those people support the opposition,” he claimed. Rainsy added that he was hopeful that there were “more reasonable” and “more realistic” people around Hun Sen who could one day convince him to relinquish power. Sok Eysan, spokesman of Hun Sen’s Cambodian People’s Party, dismissed Rainsy’s claims that support for the prime minister is declining. “He just said that to upgrade himself. He is using tactics of incitement,” he told Euronews. “The military support the government by issuing petitions and calling Sam Rainsy a national traitor. This person knows this and he only dares to speak from abroad,” he added. Eysan said the government is confident that Hun Sen will be legitimately re-elected in next year’s vote, and insisted that the upcoming case to dissolve the CNRP was in line with the country’s laws, not a political agenda.